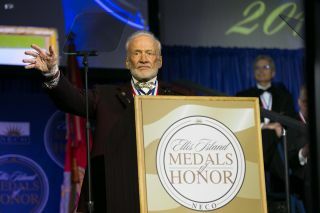 Buzz Aldrin, a former NASA astronaut and the second person to walk on the moon, gives a speech at the Ellis Island Medals of Honor ceremony on May 13, 2017. NEW YORK — Former NASA astronaut and Apollo 11 moonwalker Buzz Aldrin received the Ellis Island Medal of Honor and gave a speech about his dreams for human exploration of Mars during a ceremony here at the historic immigration site Saturday (May 13). Aldrin, who landed on the moon alongside Neil Armstrong during the Apollo 11 mission in 1969, was one of this year's 90 recipients of the prestigious award. Other recipients included the Nobel Peace Prize-winning teenage activist Malala Yousafzai, CNN journalist and TV host Fareed Zakaria, and Ohio Gov. John Kasich. Former NASA astronaut Buzz Aldrin and his assistant, Christina Korp, arrive at the red carpet after taking a ferry from Manhattan to Ellis Island for the Ellis Island Medals of Honor ceremony on May 13, 2017. As a springtime nor'easter drenched the tristate area, soaking celebrities and pummeling umbrellas in the wind, the awardees and their family members crammed inside the Miss Ellis Island Ferry at Battery Park in Manhattan and set off to the Ellis Island Immigration Museum — just a stone's throw away from the Statue of Liberty — to receive their medals. Every year, the National Ethnic Coalition of Organizations (NECO) presents the Ellis Island Medals of Honor "to a select group of individuals whose accomplishments in their field and inspired service to our nation are cause for celebration," the organization states on its website. Buzz Aldrin and Ohio Gov. John Kasich, who ran for president in 2016, seemed quite chummy during the Ellis Island Medals of Honor awards on May 13, 2017. Most notably, Aldrin is a major advocate for sending humans to Mars. But he thinks we should first demonstrate the technologies required for humanity to go to Mars by doing practice runs to the moon, Aldrin told Space.com on the red carpet. He elaborated on his ideas for Mars during a speech he gave at the ceremony. Aldrin spoke of his dream to see an international "lunar-Mars coalition" supporting Europe, Russia, Japan and China. Reusable spacecraft called "cyclers" would carry astronauts to the moon and back, followed by crewed trips to asteroids and flybys of Venus. Add to that a rendezvous and refueling system with spacecraft "parked" at Earth's Lagrange points, and humanity will be ready to start expanding this kind of space-based infrastructure to the Red Planet with the ultimate goal of colonization, Aldrin explained. "Crews will be briefly trained at the moon before their flights to Mars." Buzz Aldrin shows off his "Future Martian" t-shirt next to Space.com's Hanneke Weitering at the Ellis Island Medals of Honor ceremony on May 13, 2017. Aldrin introduced his idea for a pathway to Mars in 1985. More than 30 years later, the 87-year-old space enthusiast is still advocating for it, and he continues to support space exploration in general. Before coming to New York for the awards ceremony, Aldrin made a trip to Washington, D.C., to speak at the Humans to Mars Summit and visit the White House, where he spoke with officials about funding for space exploration. "I am actively working on the future every day. My commitment to serving this country has never wavered, and I give it my all every day," Aldrin said during his speech. "I'm proud to stand here on Ellis Island, where so many dreams began for so many people. "I hope to help shape the future of humans traveling among the stars and making homes on other planets," he added. "It is our nature to explore. We explore, or we expire. I will do all I can do to inspire the future generations. No dream is too high for those with their eye in the sky. I know, because I'm living proof."